The Pressure: NaNo definitely pushed me to write more each day. That word counter graph taunts me! I created more words than I would have if I wasn’t in NaNo, and there was one day in particular (okay, it was only Day 5 – don’t judge me!) that I felt so burnt out I would have given myself a writing holiday any other time of the year, but because of NaNo I made myself write something and felt pretty good about it. By the end of Week 2, I was at 15,000 words. A bit behind, but I didn’t care. That’s a lot of words for me! I’d moved my story forward and was really figuring out some important details. And NaNo had pushed me to do that even when I didn’t feel like writing. Burnout: As I mentioned above, I quickly experienced burnout trying to keep pace with NaNo. To deal with this, I changed my writing schedule. Part of my “slowness” is it takes me awhile to get focused and start writing, so I’ll do other things as I prep my brain to begin. However, then I’m left with a big chunk of writing time at the end of the day that’s exhausting to get through. So I switched it up – now I write something first, then when my brain feels fatigued I take a break to wash dishes or respond to emails, and then go back to writing, and repeat. These short, intermittent brain breaks stave off the burnout. Plus, this schedule forces me to complete stuff within shorter chunks of time, so I can’t procrastinate like I would with a big chunk of time where I don’t actually write anything until the last hour. Bedtime Debriefs: These help combat my slowness too. When I plan what to write the next day, beginning that writing is much easier. Plus if I’ve been struggling with the story, what’s wrong with it is more easily sorted out before bed. For some reason, my brain solves problems better right before sleep. Character Quiz: As I got farther into my novel, I added more characters that needed to be developed. Luckily, I wrote these 10 Quick Character Questions before NaNo so I was ready to do just this and didn’t spend nearly as much time flushing them out as I normally would have. Huzzah! Plus, I counted those words in my NaNo counter. I saw someone in a message board who simply counts everything in their Scrivener document, whether it’s character sketches, world building or actual chapters, and I thought hell yeah! After all, these character sketches flushed out a lot of important plot points and contributed to the overall story. Pushing Ahead: When something is wrong with my story, I cannot “push ahead” as many in the NaNoWriMo community encourage. Note that I am not revising for pretty prose; I am revising plot points that will affect the whole novel. I have to go back and fix those before I know what will happen next. I think of a novel like a skyscraper – the whole building rests on the foundation, and if the foundation is weak or any of the lower storeys have holes, the entire thing will fall over. And it’s easier to fix the foundation before the building is built than after. However, the pressure to go forward in NaNo meant that I tried to push ahead and ignore the feeling that something was wrong with my story’s foundation longer than I normally would, and consequently I had to do a bigger teardown than if I’d just doubled back to rebuild sooner. Getting a New Job: And here we arrive at the reason why I’m talking about NaNoWriMo in the past tense. Exactly halfway through November, I got a new freelance writing gig. It’s super fun and awesome, but it doesn’t leave me with enough time to write another 35,000 words by the end of this month. So, yeah. 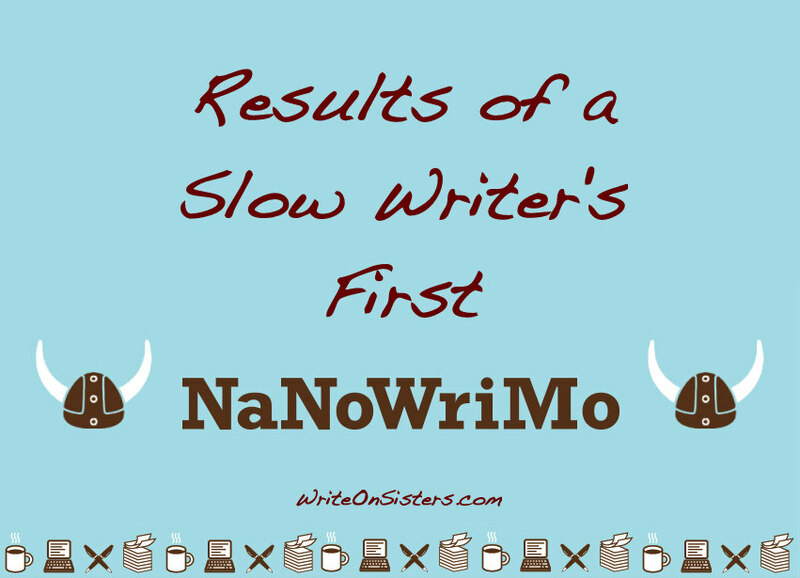 I believe I accomplished one of the main objectives of the NaNoWriMo challenge – write faster! I may never spit out words at the speed of light, but I am certainly less slow than I was before. Though I don’t expect to win #NaNoWriMo2015, I will keep writing for the rest of the month and beyond at my new, improved pace. So thanks, National Novel Writing Month! And for those of you still racing for that 50k finish line during this last week of November, good luck! This was my second year with NaNoWriMo. Last year was easier to hit the limit and exceed the 50k word count. I counted any added words during those revisions to my daily count. This year, I started the second book in a planned five book series and the first manuscript was done but writing the sequel ended up causing changes in the first rough draft in this series and so I went back and made a few changes in that book too—-not many but some. Later, during revisions of the 1st book in the series, there will be a LOT of changes thanks to writing the 2nd book in the series. Okay, technically I cheated, because I wrote 1,515 words for this book on August 22, 2105. I just couldn’t help it. I woke up one morning with an idea I liked and was afraid I’d forget it if I waited until November. When we deal with the complexity characterization, setting and important plotting, I don’t think we can write faster. Maybe write more hours if there are enough hours in a day after sleep and life. That’s how I feel too. I’ve tried to rush that part before and just wrote myself into a mess. Also, I wish I didn’t need 8 hours of sleep – I could get so much more writing done! I have also often thought about what I could get done by giving up sleep. But I’ve also read that not sleeping will kill us faster. As for writing fast messing up the story—that’s what happened last year when I rushed through the 1st manuscript in this five-book series. The revisions to fix all that rushing is going to take a lot longer than one month. I was wondering how it was going for you. For me, the thrill of NaNoWriMo is writing quickly without an idea of where the story is going. It’s an adrenaline-rush of trusting that the words will come, the story will come, the characters will lead me. And mostly, for me, that happens. I was hoping you’d get a feel of that, maybe even in your short bursts of writing (great idea, by the way). Did you? Were you able to let go of the left-brain in those times? That said, pantsing does make the rewrite more of a long haul, as you pointed out. However, (I’m arguing with myself here), the more I read and absorb plot, the more I’m able to shape it in that first blind draft. But…I want to try it your way some time. See what that’s like. Honor your own way of working. Which you did. Well done. Congratulations on the 15,000 words and the new job. That seems to me like a full month. And the things you’ve learned about your writing style/schedule should help you out even after NaNoWriMo, So you’ve succeeded already. Congratulations on the new freelancing gig! That’s awesome! This is the first year I actually finished NaNoWriMo. And the one thing I learned that really helped was short bursts. I can’t sit for long hours writing, I’m too distractable. 😀 So, I set an old fashion egg timer for 25 minutes where I actually write. Then I take a 10 minute break and do chores. After 4 blocks of 25 minutes, I take a 25 minute break to eat or play Farm Heros Saga or whatever. I completely agree with you on the whole foundation thing. That’s usually what takes me the longest to flesh out. I’m really glad you were able to find so many positive things even though you didn’t finish…this time. 😉 It’s taken me 5 tries to finally get to the finish line. I didn’t participate in NaNoWriMo last year. I’d just published my first novel and I was scrambling to promote and to finish the sequel and get it to editing at the same time. My brain was in overdrive and starting a new piece of writing to hit a 50,000 word target was the last thing on my mind. I decided to participate this year because I actually finished a writing project in October and I had a novel laid out that I wanted to work on. I’m looking at something that, when finished, is going to be somewhere between 60,000 and 70,000 words. NaNo doesn’t quite get me there so the impetus to get to 50,000 before the end of the month, doesn’t ring true for me. I might make it, I might just get close. What NaNo is doing is keeping me on task and forcing me to try and write consistently every day. It helped push the start a little faster too: My story is all laid out. I know where it started and exactly where it’s going. The plot holes are filled. Now, I’m writing the fun part…the meaty dialog and the action scenes. I think that’s what NaNo really should be: because you force yourself to a pace you don’t normally do, you have to device new ways to do your usual stuff… and that’s where you learn. That’s why I love NaNo and why I keep partecipating. NaNo taught me the most important thing a few years ago: that I can write even every day if I want and I put effort into it and if I do so, I do a lot more work than I’d ever imagine. It was a true revelation. Thanks, Sarah! I appreciate the sentiment that I won. It really does feel like a win; after all, I tried something and I improved! And I think I will do it again next year… or next month. #DeDoWriMo (December Do-over Writing Month) anyone?